Welcome to Montenegro, one of the youngest countries in the world! 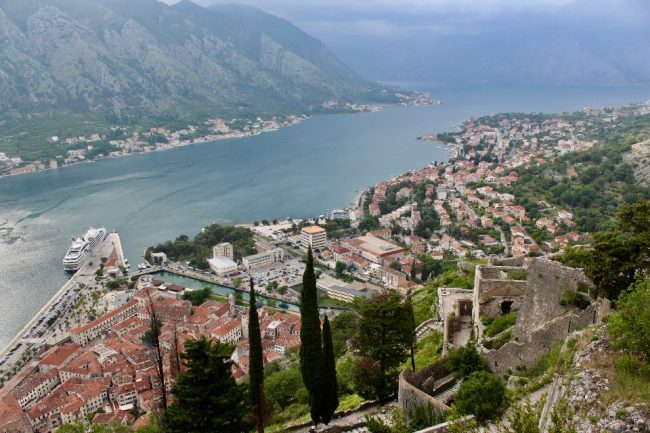 Independent since June 2006, it is one of the most physically stunning countries in the Balkans, with high mountains, a coast along the Adriatic, and the Bay of Kotor where nestles one of its most popular towns: Kotor. 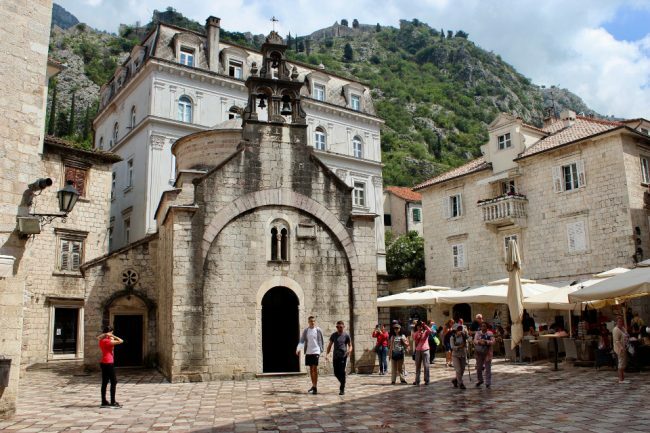 Learn all about visiting this charming destination in my travel guide to Kotor. The Bay of Kotor resembles a fjord and forms an unusual “double-bay” which narrows down before opening up again. Several towns are dotted along its shores, and backed by the looming peaks of the Dinaric Alps, providing stunning views all around the bay. Old Kotor is a medieval walled town shaped like a triangle, with one gate in each of its three corners. 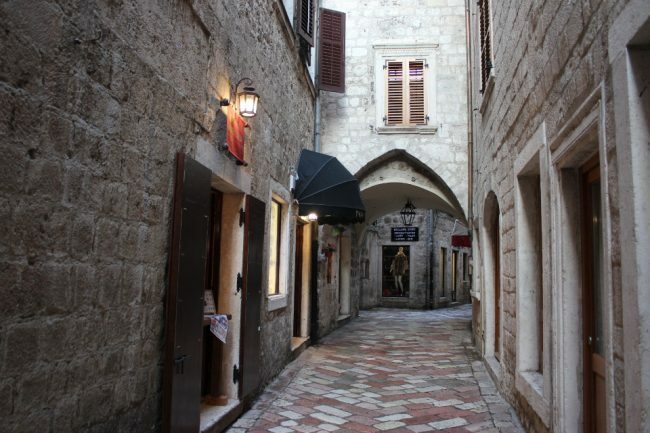 Inside, a warren of narrow alleys open up into a handful of squares (called Trg in Montenegrin) surrounded by churches, restaurants, and a few museums. Right behind the town, steep mountains rise sharply into the sky. They’re so close and tall, I gasped every time I saw them! Kotor is well known for its street cats, and you’re likely to encounter them as soon as you pass through one of the town’s gates. Each one seems to have a favourite spot, such as a particular restaurant, or even a place along the walls that climb up behind the Old Town. For the most part, they seem well fed and fairly healthy, and are not bothersome. They may stare at you in anticipation while you eat your fish dinner though. Many people, both locals and tourists give them food. The town has capitalized on the cat trend by opening some cat-themed gift shops, and even a Cat Museum. 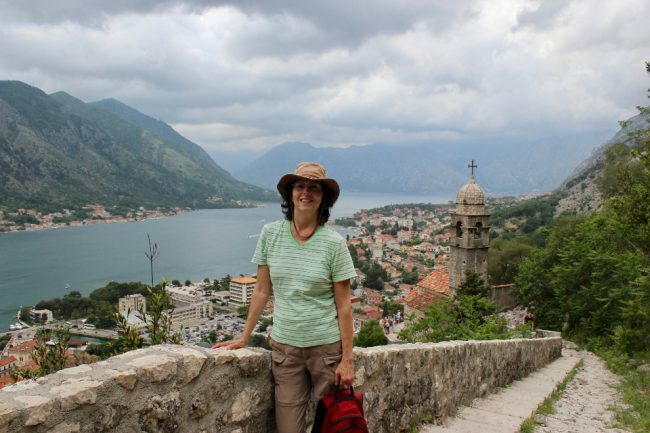 Finally, Kotor is a great place to visit for solo travellers. As a solo female, I had no issues whatsoever, either in the Old Town or new part of town where my accommodation was located, even after dark. Locals were always friendly and helpful. The official language of Montenegro is Montenegrin, which is a variant of Serbo-Croatian (just like Croatian, Bosnian, and Serbian). But fortunately, people in the tourism industry also speak good English. Restaurant menus come with an English translation as well. Both Roman and Cyrillic alphabets are used on maps, street signs, etc. 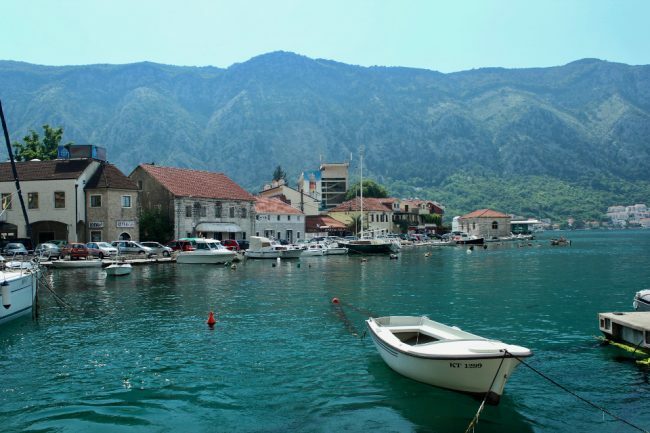 Unlike its neighbours, Montenegro uses the Euro as its currency, although it does not belong to the EU …. yet. The time in Montenegro is the same as in Croatia and Western Europe, that is 6 hours ahead of New York / Toronto. Although Kotor isn’t swamped with independent travellers right now, it is a cruise ship port, and tour groups do come through during the day. One more reason to stay for at least a couple of nights. If you’re flexible and want to avoid the days when the biggest cruise ships are in town, you can check the ship schedule, complete with arrival and departure times. The guidebook I used on this trip is Lonely Planet Montenegro. You can get to Kotor easily from either Dubrovnik (two hours by car or bus plus time to cross the border) or from Bosnia-Herzegovina. If you’re coming from Dubrovnik by bus, try to get on the first bus of the day since there is a separate line for buses at the border. If there are several buses ahead of you, you may need to wait an hour or more. Below are the main things to see and do during your stay. Give yourself at least two full days in Kotor, and more if you’re planning on visiting other nearby towns. The top thing to do in Kotor (no pun intended) is walking up the walls that cling to the mountains behind the town, all the way to the ruins of the fortress 260 metres above sea level (look for the flag). There are two entrances from the eastern wall inside the Old Town, and you must pay €8 to pass through. I was told that the walk would take 40 minutes one-way, but I took it really slow, stopping for photographs every few minutes, and it took me 90 minutes to go up the 1350 steps! It may look daunting from the ground, but it’s pretty feasible even if you’re not in great shape. Just go at your own pace. I saw all kinds of people making the climb, from children to seniors with walking poles. The views are gorgeous from up there. In fact, the views of the Bay of Kotor are beautiful no matter how high up you are. So even if you can’t go all the way up, you’ll still get nice views. There is a small church about halfway along the path. People in Kotor are mostly Christian Orthodox, but you will also find some Catholic churches. There seems to be a church on every square in Kotor Old Town. Here are the main ones. 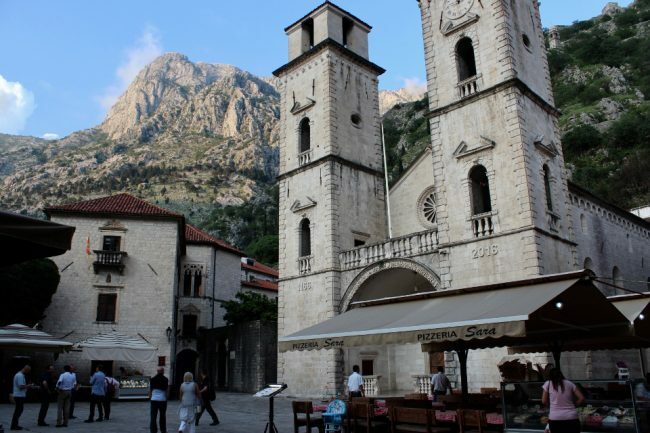 St Tryphon’s Cathedral is the most impressive religious building in Kotor. A Catholic church in romanesque style, it has a small museum upstairs and a balcony with views over the square (Trg Sv Tripuna). St Nicholas’ Church is a relatively new Orthodox church (1909). St Luke’s Church is cute and small, but quite old. It started life as a Catholic church in 1195, then was shared by both Catholic and Orthodox faiths (on different days) before becoming Orthodox. You can still see fragments of 12th-century frescoes. St Mary’s Collegiate Church is a Catholic church dating from 1221 with 20th century bronze doors covered in bas-reliefs. There are also two small museums facing each other: the Cats Museum and the Lapidarium Museum. Strangely, the Cats Museum was closed when I showed up. It contains prints, coins, photographs and other memorabilia with a cat theme, including some predating WW1. Your €1 admission fee is used to take care of the local cats. Since it was starting to rain, I hid into the equally small Lapidarium Museum (€2 including tour) across the way. I was the only person there and got a private tour of the many sculptures and architectural fragments that were discovered when the 14th century church of St Michael collapsed during the 1979 earthquake. The ruins of two older churches were discovered below it, from the 6th and 9-11th centuries respectively. The oldest artifact is a Roman statue’s head from the 1st century AD. 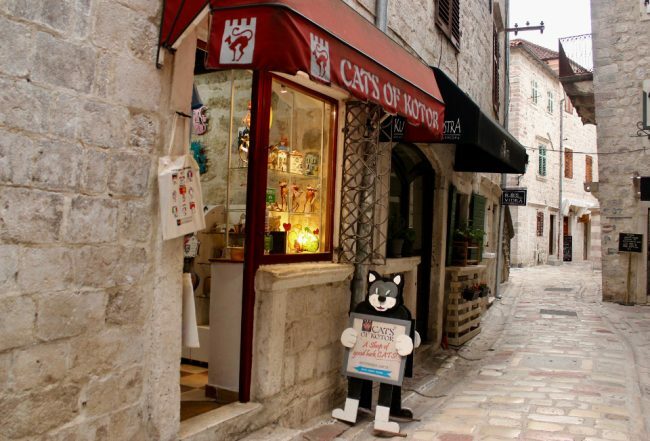 There are many small souvenir shops along the narrow alleys of Kotor Old Town, including several cat-themed gift shops. Cats of Kotor has the best handicrafts in my opinion. A lot of the accommodation in Kotor consists of private apartment rentals, especially at the lower price end. If you choose something outside of the Old Town, it will be even cheaper. You can search for those on Booking.com. I stayed at Marinero apartments, about 10 minutes walk from the Old Town, and about six minutes walk to the bus station. I had a clean modern one-bedroom apartment with balcony all to myself for only €30 per night. For about double this money, you can stay at Palazzo Drusko, a guesthouse full of character and antiques located in a 600-year old palazzo in the Old Town. If you prefer a hostel within the walls, try the Old Town Youth Hostel. You can of course stay with some locals by renting a room on AirBnB. I have to admit that I’m using Booking more and more these days, especially when reserving early, because you don’t have to pay in advance and you can cancel free of charge until a few days before your stay (except on some super deals). 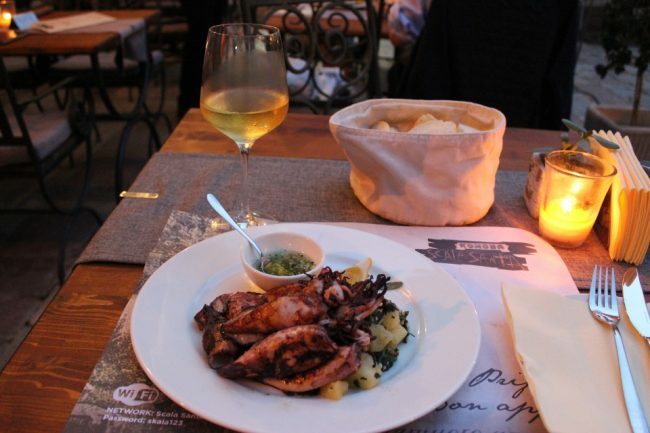 Seafood is very popular in Kotor, especially octopus, squid, and grilled fish. A popular sauce for seafood is called buzara, a blend of olive oil, wine, garlic, and mild spices. Blitva, boiled potatoes mixed with wilted Swiss chard and garlic, is a common side dish. Local beer (pivo) is cheap, and Montenegro produces wine too (both white and red). As for sweets, you’ll find a few gelato counters in the Old Town of Kotor. Or you could try cherry strudel, a specialty of the region. Here are some restaurants that I tried and liked. Located on Trg od Drva, Bastion is an elegant seafood restaurant with attentive service and a big outdoor covered terrace in a quiet corner of Kotor Old Town. This one is not located within the walls of the Old Town, but rather along the waterfront. It specializes in both meat and seafood, and has a nice patio with a view of the water. It tends to attract large Chinese groups at lunch though, so go early. Café Bar Perper has several tables outside and serves a decent cappuccino, even though the service is a bit gruff. O’Clock Coffee is a cool and quiet indoor space run by a friendly Korean woman. She makes ice lattes and her own pastries as well. Very zen. If you want to day trip to nearby towns, buses are the main mean of transportation in Montenegro. Kotor’s bus station is located about 400 metres south of the Old Town, along the main road. Buses travel frequently to towns around the Bay of Kotor, to the Coast, as well as the interior of the country and beyond. You can check the bus schedule, and either buy your tickets online (if you have a way to print them), or at the ticket window where they speak some English. 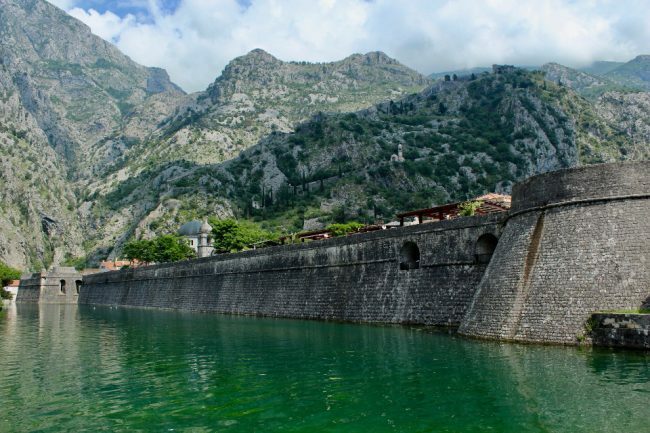 Here are some easy day trips you can do if you run out of things to do in Kotor. Budva is located on Montenegro’s Adriatic Coast. In addition to a medieval walled town, it also offers several (coarse) sand beaches. Slovenska, the main Mediterranean-style beach, stretches for over a kilometre to the northeast of the Old Town. It is set against a boardwalk lined with various restaurants and shops, and attract lots of young people. To the south of the old town are two quieter beaches, Ričardova Glava and Mogren Beach, separated by a headland featuring the statue of a naked dancer. As expected, this attracts lots of youngsters who scramble up to the statue for photographs (not all of them in good taste). When you tire of beaches, you can visit several churches, the Archeological Museum, and the Citadel within the Old Town itself. Or just plop yourself on a terrace for a cold pivo (beer) and a rest. 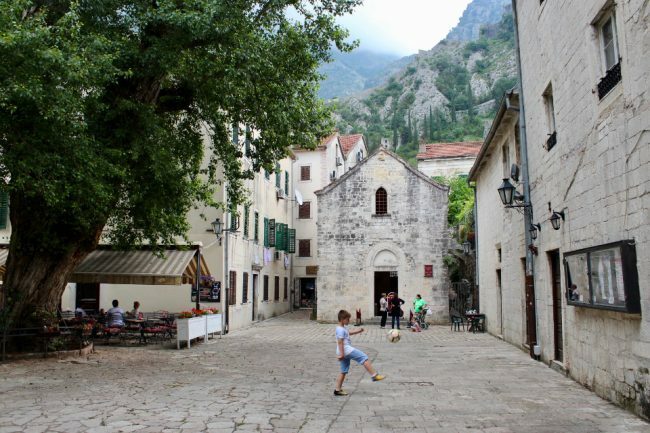 The Old Town of Budva is pretty, but nowhere as atmospheric as Kotor’s. Buses take between 25 to 45 minutes to reach Budva from Kotor. Perast is a tiny town in the Bay of Kotor, wedged between water and mountains. The main attraction here is a boat trip to tiny Our-Lady-of-the-Rock Island across from town, which features a church from 1630 covered in Venetian paintings, and a small museum. I paid €7 for the boat trip, but I think you could bargain this down, especially when not busy. 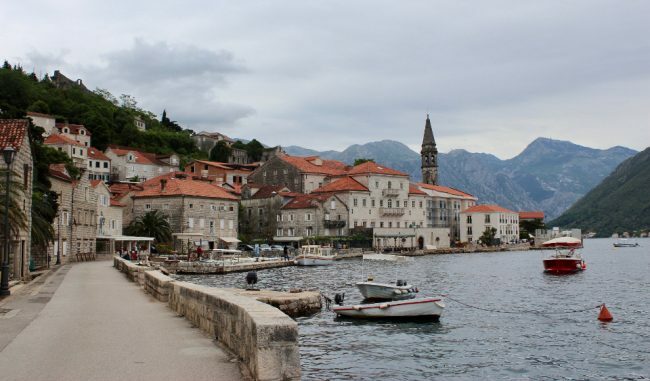 Back on the mainland, you can visit St Nicholas Church, the Perast Museum, and a few restaurants, all located along the one and only main road. For a filling meal, I recommend Konoba Školji, which specializes in grilled meats and seafood. Buses take around 30 minutes to reach Perast. They will drop you off along the road above town. Make sure to tell the driver that you want to get off. You may be able to get a water taxi from Kotor during the summer season. I didn’t make it to Herceg Novi because I ran out of time, but it was on my list. Located at the entrance to the Bay of Kotor, Herceg Novi is another fortified town (only 600 years old) with access to pebbly beaches and swimming. You can read more about it here. It should take about an hour by bus from Kotor. What I likes about old town Kotor is the street cats. I love cats no matter what country I go. P/s : Kotor in Malaysian language is dirty. I love cats too! I thought you meant that “kotor” is a dirty word in Malay, but it actually means “dirty”. Ha ha! Wow! 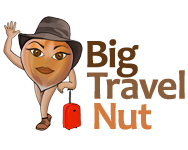 Honestly, I haven’t heard of this place before and after reading your post, it makes me want to include this place for my travels. Never been to Montenegro too and I assume there is a lot of beautiful places just like this old town Kotor. By the way, that octopus dinner you have looks delicious!